AMHERST, N.Y. – Buffalo’s Albright-Knox Art Gallery has launched a newly created interactive mobile gaming application called ArtGames 2.0 that links players with modern and contemporary works of art, which was developed through a unique collaboration with the Daemen College International Center for Excellence in Animation (ICEA) and Empire Visual Effects. 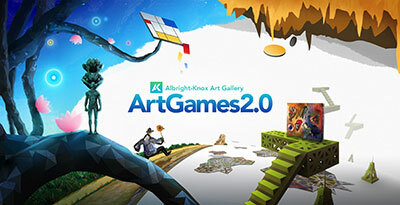 ArtGames 2.0 comprises fun and educational games that familiarize players with different art styles and movements, various artists and artistic concepts, and masterworks from the AK collection. Users will first enter the home environment—a 3-D interface updated in real-time—where they will have access to all ArtGames 2.0 portals. Each portal contains a different style of game that was designed around the artwork that inspired it. All Things Media in New Jersey also collaborated on the project, which included input from some of the artists whose works were sources of inspiration for individual games, such as Do Ho Suh and Jason Middlebrook. The application is available through the Apple App Store and Google Play Store. Artworks that inspired games in the application include Vincent Van Gogh’s “La Maison de la Crau” (The Old Mill); Vassily Kandinsky’s “Fragment for Composition VII”; Robert Delaunay’s “Soleil, Tour, Aéroplane” (Sun, Tower, Airplane); Piet Mondrian’s “Composition No. 11, 1940-42—London, With Blue, Red, and Yellow”; Jorge Pardo’s “Untitled”; Do Ho Suh’s “Karma”; Jason Middlebrook’s “Underlife”; and multiple works by Clyfford Still, starting with “1957-D No. 1,” one of the masterpieces of the AK’s famous abstract expressionist collection. Developed over the course of 18 months, ArtGames 2.0 is the first project undertaken by the AK Innovation Lab, which engages a broad-based series of intellectual collaborations across an array of disciplines in the arts, sciences and technology to explore new ideas and develop solutions to challenges confronting museums and societies locally, regionally and globally. The lab strives to define new models for museums as productive and engaged creative hubs at the center of social and civic vitality. The AK Innovation Lab is made possible, in part, through the support of the Seymour H. Knox Foundation, in conjunction with the John R. Oishei Foundation, an anonymous family foundation, and by the New York State Council on the Arts with the support of Gov. Andrew M. Cuomo and the New York State Legislature.